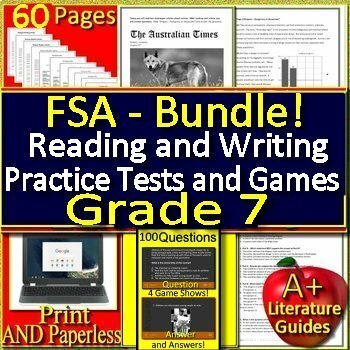 7th grade FSA Writing AND Reading Practice Tests AND Game Show Bundle! 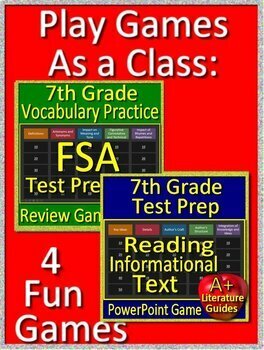 Improve FSA Grade 7 Reading and Writing Scores with this bundle designed to help students excel at the Florida Standards Assessment. 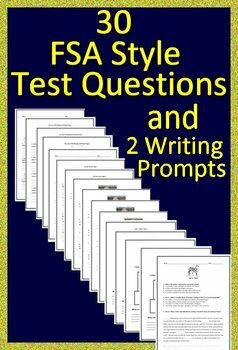 Includes THREE original multi-page reading informational and narrative passages with 30 "FSA style" test questions, FOUR original writing passages with two writing prompts (informative and argumentative), and four game shows with 100 questions and answers. The reading sets are both print and go AND Google paperless. Both versions are included with your purchase. The games, however, work much better in PowerPoint than in Google classroom.